Why Do Cheeses Brown When Placed Under Heat? 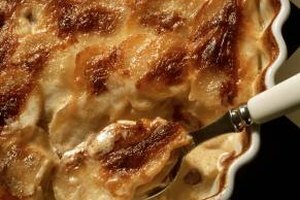 Crunchy, browned cheese topping on a lasagna or gratin is irresistibly delicious. Foods turn brown in one of two general ways. Enzymatic browning occurs when food is exposed to air; it's avoided with of fresh fruits and vegetables but gives coffee, tea and cocoa their characteristic colors. Non-enzymatic browning happens when foods are exposed to heat. These are the reactions that can give cheese a golden brown color and deepened flavor. Some of the browning and flavor changes when cheese is placed under heat may be due to caramelization. Caramelization is a non-enzymatic browning reaction that happens when the heat breaks sugar molecules apart. The longer food is heated during caramelization, the more those molecules change, resulting in color changes from a pale white or yellow to deep yellows and finally to golden browns. Caramelization also brings out sour, butter, fruity, sherry-like, butterscotch, caramel or nutty aromas and flavors. Most of the browning you see in cheese exposed to heat is due to the Maillard reaction, a non-enzymatic browning process named after the 19th-century scientist who first observed it. Cheese browns under this process because high heat causes amino acids and simple sugars to rearrange in a pattern that reflects brown light. New aroma and flavor molecules are also formed, resulting in incredibly varied flavor changes. Cheese can develop earthy, meaty, savory, floral, sulfur and chocolate aroma and flavor changes in addition to those found in caramelization. Cheeses don't all melt and brown in the same way. When cheese is heated, it falls into one of three basic categories: stretchy and stringy, smooth and flowing and non-melting. The "melting and flowing" category is the largest, and these cheeses brown the best. Robust, low-moisture robust choices like cheddar, gouda, gruyere, Monterey jack and fontina brown nicely. Very hard, aged cheeses like Parmesan must be grated first. Stringy cheeses like mozzarella and provolone must be mixed with a firmer cheese for good browning results. If cheese melts too quickly or at too high a temperature, the proteins can tighten together and squeeze out fat and moisture, giving you a firm blob of cheese in a puddle of fat. For successful browning reactions, grate your cheese and let it reach room temperature before cooking. This reduces the amount of time it needs under heat before melting and browning. Keep an eye on your temperature. Although Maillard reactions happen under high heat, keep the temperature below 355 degrees Fahrenheit. Cheese burns at higher temperatures, causing an unwanted bitter flavor.